Purpose: To present an accurate account of the life of Christ and to present Christ as the perfect human and Savior. Author: Luke - a doctor (Colossians 4:14), a Greek, and Gentile Christian. He is the only known Gentile author in the New Testament. Luke was a close friend and companion of Paul. He also wrote Acts, and the two books go together. Original audience: Theophilus ("one who loves God"), gentiles. Setting: Luke wrote from Rome or possibly from Caesarea. Key people: Jesus, Elizabeth, Zachariah, John the Baptist, Mary, the disciples, Herod the Great, Pilate, Mary Magdalene. Special features: This is the most comprehensive of the Gospels. The general vocabulary and diction show that the author was educated. He makes frequent references to illnesses and diagnoses. Luke stresses Jesus' relationships with people; emphasizes prayer, miracles, and angels; records inspired hymns of praises; gives a prominent place to women> Most of 9:51-18:35 is not found in any other Gospel. 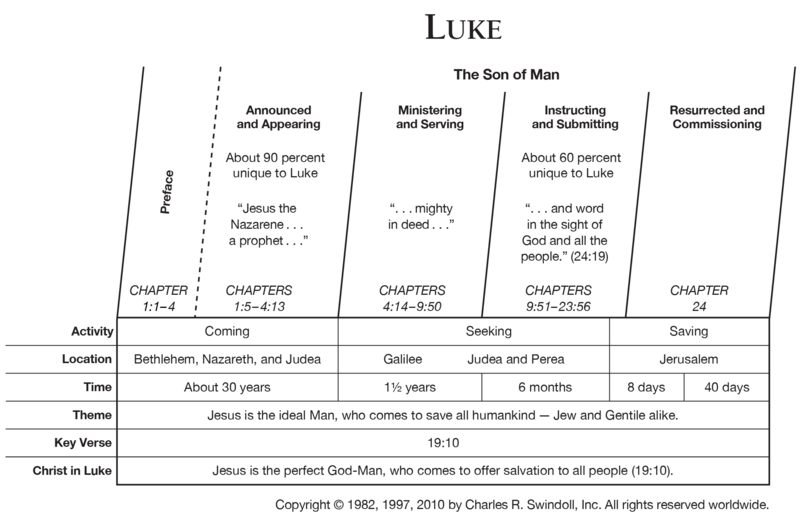 Luke provided an orderly account of the life and ministry of Jesus Christ for a Hellenistic readership. His purpose was to certify that Jesus was the promised Messiah and the Son of God, who became the Son of Man in order to provide the way for both Jews and Gentiles to enter the kingdom. New Geneva study Bible. 1997, c1995 (electronic ed.) (Lc 1.1). Nashville: Thomas Nelson. Word in life study Bible . 1997, c1996 (electronic ed.) (Lc 2.36). Nashville: Thomas Nelson. *The name Palestine was not applied to the territory of the Israelites until after the Romans had destroyed Jerusalem in a. d. 70. Apparently the name was intended as an insult. To find out why, see “What Should We Call ‘The Land’?” at Num. 34:2. Word in life study Bible . 1997, c1996 (electronic ed.) (Lc 3.1). Nashville: Thomas Nelson. Word in life study Bible . 1997, c1996 (electronic ed.) (Lc 9.1). Nashville: Thomas Nelson. Sovereign ruler of the Roman Empire. Augustus (Octavian) ruled with as much practicality and goodwill as possible. A standing army was needed to preserve law and order only in those outlying provinces still struggling with conflict. Wherever possible, provincial rule was delegated to local authorities or to Roman senators, called proconsuls. The title Caesar was taken from the family name of Julius Caesar, father of the Roman Empire. Rulers of the senatorial provinces. The Senate met twice each month for legislative, administrative, and judicial purposes. Senators were chosen by lot to rule in the provinces. In the time of Augustus, the Senate comprised 600 members of the Roman aristocracy. Proconsuls were appointed for one-year terms and tended to act expediently, enriching themselves before returning to Rome, where they remained politically active. Senatorial provinces were usually older, more stable and nearer to Rome. Those named in the New Testament include Achaea, Asia, Bithynia, Crete, Cyrene, Cyprus, Macedonia, and Pontus. Roman law was approved by the Senate and implemented locally by procurators, proconsuls, and, when necessary, the Roman army. When the silversmiths of Ephesus complained against Paul (Acts 19:38), proconsuls were mentioned as the appropriate officials to settle the dispute. Relatively low-ranking rulers of the imperial provinces. A procurator could gain political freedoms for the region he governed by demonstrating the area’s loyalty to Rome and reverence for the emperor. Privileges might include self-government, freedom from taxation, and freedom of religion. The procurator had to maintain law and order in his jurisdiction, putting down any threat to the social order, and, if necessary, calling in the Roman army. Imperial provinces, such as Judea, tended to lie on the frontiers of the empire, in areas of conflict. They required large standing armies to maintain order under the command of appointed governors. Provinces mentioned in the New Testament include Judea, Syria, Galatia, Cappadocia and Egypt. A subordinate ruler under a proconsul who commanded troops, handled administrative tasks and, in the larger provinces, collected revenue. At the time of Augustus, there were 11 senatorial provinces (under senatorial supervision) and 21 imperial provinces (directly under the emperor or his agents). Commanded non-Roman auxiliary troops and governed the smaller provinces, mostly as chief financial officers. Senators, procurators, legates, and prefects all preferred that local leaders handle most legal problems; theirs was the court of last resort. Under Rome, little more than puppet governors appointed by the emperor. Even Egypt was ruled by a viceroy representing Rome as a successor to the pharaohs and the Ptolemaic dynasty (323–30 b. c. ). They ruled in the wake of Alexander the Great. The sons of Herod the Great disputed their father’s will in 4 b. c. Archelaus received half of his father’s territory, making him an ethnarch; Antipas and Philip both received one-fourth and became tetrarchs. Tetrarch came to designate any petty prince or local magistrate in the Middle East. Official guard of the Roman emperor and the elite corps of the empire. Their salaries and privileges exceeded those of other Roman soldiers. Originally stationed in Rome, the Praetorian Guard was later dispersed throughout the provinces. The Guard was disbanded in the third century a. d. , due to their threat to the emperor himself. A non-commissioned officer commanding at least 100 soldiers. Most served for life, much longer than the required 20 years. Sixty centuries made up a legion, a force of 6, 000 troops. A local law enforcement officer. New Geneva study Bible. 1997, c1995 (electronic ed.) (Lc 1.35). Nashville: Thomas Nelson. The two most popular titles or names Christians use in speaking of our Lord are Jesus, a translation of the Hebrew word Joshua, which means “Yahweh is Salvation,” and Christ, a transliteration of the Greek term Christos, meaning “Anointed One” or “Messiah.” Following are some other significant names or titles for Christ used in the New Testament. Each title expresses a distinct truth about Jesus and His relationship to believers. New Geneva study Bible. 1997, c1995 (electronic ed.) (Lc 2.14). Nashville: Thomas Nelson. New Geneva study Bible. 1997, c1995 (electronic ed.) (Lc 6.13). Nashville: Thomas Nelson. The Gospel writers devoted much of their material to the events leading up to the crucifixion of Jesus. The final week of His earthly ministry began with the trumphal entry into Jerusalem and the “Hosannas” from the crowd that changed to cries of “Crucify Him” before the week was over. Jesus apparently spent most of the week teaching in the temple area during the day. His evenings were spent in the home of Mary, Martha, and Lazarus in Bethany. Sigificant events during this week included the plot of the of the Sanhedrin, Jesus’ betrayal and arrest, the trials of Jesus, His hourney to Golgotha down the Jerusalem street known today as the Via Dolorosa (“Way of Suffering”), and the resurrection, After His resurrection, Jesus ministered another forty days before His ascension. New Geneva study Bible. 1997, c1995 (electronic ed.) (Lc 22.47). Nashville: Thomas Nelson. (1:1-4:13) From an infant who could do nothing on his own, Jesus grew to become completely able to fulfill his mission on earth. He was fully human, developing in all ways like us. Yet he remained fully God. He took no shortcuts and was not isolated from the pressures and temptations of life. There are no shortcuts for us either as we prepare for lives of service to God. 3. Jesus's ministry in Jerusalem Jesus taught great crowds of people, especially through parables, which are stories that illustrate great truths. But only those with ears to hear will understand. We should pray that God's Spirit would help us understand the implications of these truths for our lives so we can become more and more like Jesus. C. DEATH AND RESURRECTION OF JESUS, THE SAVIOR (22:1-24:53) The Savior of the world was arrested and executed. But death could not destroy him, and Jesus came back to life and ascended to heaven. In Luke's careful, historical account, we receive the facts about Jesus' resurrection. We must not only believe that these facts are true, but we must also trust Christ as our Savior. It is shortsighted to neglect the facts, but how sad it is to accept the facts and neglect the forgiveness that Jesus offers to each of us. Over the centuries, the Jewish religious leaders had added rule after rule to God's law. For example, God's law said the Sabbath is a day of rest (Exodus 20:10). But the religious leaders added to that law, creating one that said, "You cannot heal on the Sabbath" because that is "work." Seven times Jesus healed people on the Sabbath. In doing this, he was challenging these religious leaders to look beyond their rules to their true purpose-to honor God by helping those in need. Would God have been pleased if Jesus had ignored these people? Jesus sends a demon out of a man. Jesus heals a lame man by the pool of Bethesda. Jesus heals a man with a deformed hand. Jesus restore a crippled woman. Jesus heals a man with swollen arms and legs. Jesus' trial was actually a series of hearings, carefully controlled to accomplish the death of Jesus. The verdict was predecided, but certain "legal" procedures were necessary. A lot of effort went into condemning and crucifying an innocent man. Jesus went through an unfair trial in our place so that we would not have to face a fair trial and receive the well-deserved punishment for our sins.